Ignite Speed Networking - What is it? 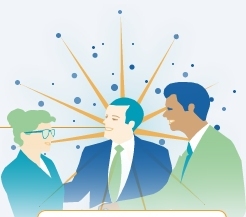 Ignite Speed Networking will empower you to energize your networking program! Basic speed networking has been one of the fastest growing forms of networking over the last few years. It involves matching networkers one-on-one through a series of 5-10 matchups during an event. For a lot of participants and facilitators, this new type of event falls flat, not allowing for enough connections and having too much potential for stale meetings. Ignite Speed Networking takes the energy and excitement of one-on-one speed networking and infuses effectiveness and comfort to make the most revolutionary networking event you'll ever experience! Instead of meeting just one person at a time, participants meet at tables of 4-10 for comfortable networking sessions that last 5-12 minutes each. When time is up at a table, everyone moves on to the next, pre-assigned table to meet with a brand new group of people. New opportunities to ignite a business spark are found at each table – duplicates are all but eliminated throughout the process. At a typical Ignite event, each participant will meet with 40-50% of attendees - blowing away the potential meetings you can achieve at a nonuctured event (e.g., "cocktail reception") and 4-5 times better than basic speed networking.